The SWP is hosting the 2015 UP-Wide Medication Collection at 15 locations across the UP. 138 Fortune Lake Camp Rd. Each location will have a pharmacist and a law enforcement officer. Items accepted include all medications (over the counter, prescription, liquids, and narcotics), inhalers, needles, and products containing microbeads. Please be prepared to empty the contents of all containers. No plastic bags please. In addition to contributing to increasing plastic pollution in the Great Lakes and other waterways, microbeads – or small plastic particles found in products such as exfoliants, soaps, and toothpastes – also pose a threat to aquatic species, terrestrial wildlife, and potentially human health. Microbeads are not biodegradable and once in the environment can soak up harmful toxins such as DDT, PCBs, and other chemicals. 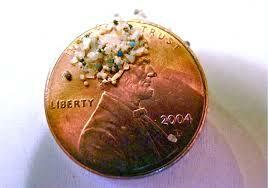 If ingested by fish or birds, microbeads may impede normal digestive processes. Higher trophic level organisms may also be affected if the absorbed toxins are transferred up the food chain. Many companies are beginning to recognize the negative impacts of incorporating plastic microbeads into products and are increasingly utilizing substitutes such as sea salt, pumice, oatmeal, and cocoa beans. SWP Medication Collection 2015 Event Flyer for printing and distribution. This event is made possible by a grant from the Michigan Department of Environmental Quality Community Pollution Prevention Program. Over the last decade the SWP has received numerous accolades for Great Lakes Pollution Prevention. In collaboration with the Earth Keepers faith network, the SWP hosted several one-day community pollution prevention events at 18 locations UP wide. These events collected: 45 tons household hazardous waste, 320+ tons of electronic waste, and over 1 ton of old and unwanted pharmaceuticals. Look for more information on the 2015 Community Wide Pharmaceutical Collection soon! Are Pharmaceuticals present in the environment?Pharmaceuticals have been found in waterways and waste water effluent throughout the world. A2002 Geological Survey (USGS) study found pharmaceutical and personal care product contaminants in 80% of 139 streams sampled in 30 different states. While detected concentrations may be low, many may be continuously introduced to the aquatic environment. Even those pharmaceuticals that break down quickly have a quality of persistence in the environment. How do pharmaceuticals enter the environment?Residential and commercial pharmaceuticals can follow two primary pathways to the environment. The first is through human excretion into the sanitary sewer. The second is through direct disposal into septic tanks, sewers or landfills. How should one properly dispose of unwanted and expired medications?You can either save them for a local collection event or currently there are a number of locations across the UP hosting a permanent collection bin for old and expired medications. Check with your local law enforcement agency or visit one of the pharmacists hosting a “Yellow Jug.” Find a location near you with the below map. View Yellow Jug Old Drugs www.greatlakescleanwater.org in a larger mapFinally, if you have to throw them out please do it safely and according to these Drug Disposal Guidelines. How are pharmaceuticals affecting our waters?There is research showing that even trace amounts of some medications like steroids, antibiotics, etc are changing fish reproductive biology.Visit the EPA website for a more information.Funding for this webpage is provided in part by the Michigan Department of Environmental Quality Pollution Prevention Program. Feel free to print the stormwater ads! The SWP collaborated with Marquette area dentists to install mercury amalgam separators to their systems to separate the mercury from dental wastewater. Over 30 dentist offices in the Marquette area did so (see picture). Once the mercury is separated out it can then be properly disposed of at the local hazardous waste recycling facility. Since that time the Marquette Waste Water Treatment Plant has seen a 40% reduction in mercury in the effluent going to Lake Superior.